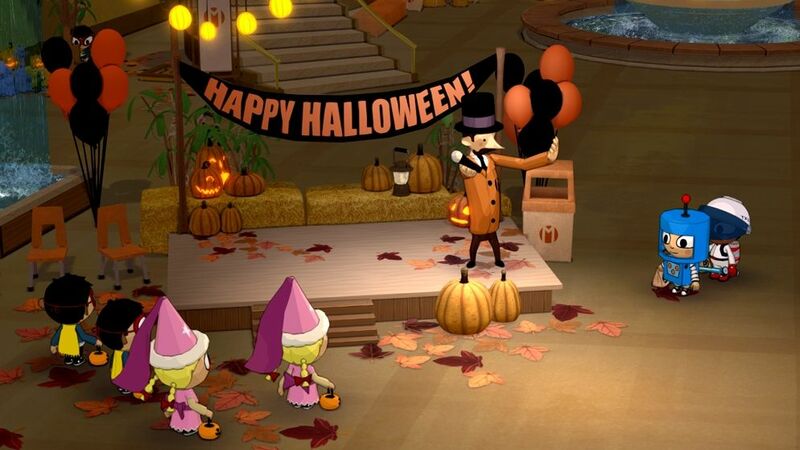 A recent Halloween tradition of mine has been to play the game Costume Quest by Double Fine Entertainment. It’s perfectly detailed Fall environments capture the spirit and feel of Halloween unlike any other experience. I would like to share this wonderful game with you today in the hopes it becomes your new family tradition as well! Participate in the costume contest inside the mall! The game takes place on Halloween night in fictional Schafer County. You play as either Wren or Reynold a sister and brother who set out on Halloween for a night of trick or treating! Unfortunately, your sibling is immediately kidnapped by evil Grubbins! (You can play as either the sister or brother). The Grubbins are sinister monsters who are secretly plotting to take over the entire world and consume all of its candy! Oh, the horror! You now have no choice but to team up with your neighborhood friends and stop the Grubbins before Halloween night is over! The fun really comes to life in the gameplay. 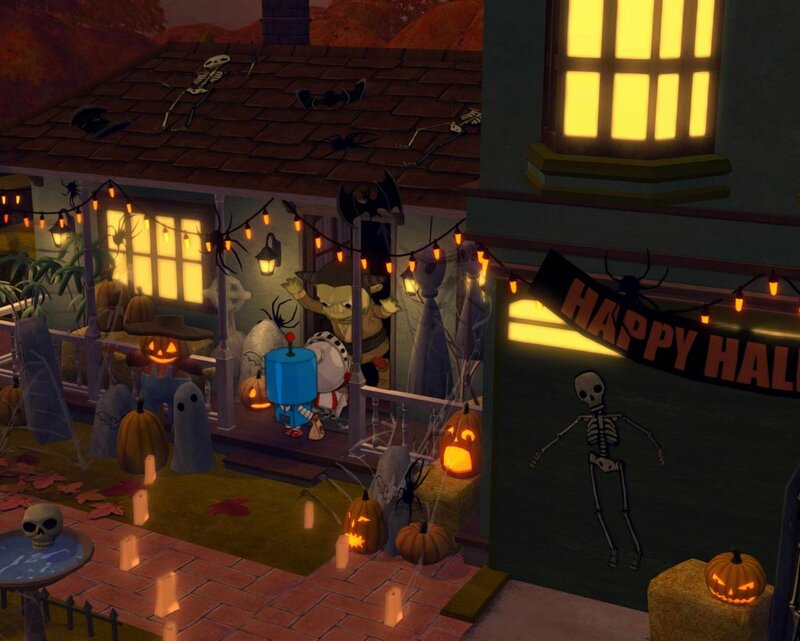 You essentially get to go from house to house trick or treating, collecting candy and using it to buy stamps which can be used to power up your different costumes throughout the game. Of course, it’s not all fun and games when trick or treating, for behind certain doors Grubbins lay in wait ready to pop out and attack! When they do attack, the game play is a simple battle system of tap this button and attack, run away, or use special ability. It is very intuitive and easy for a 10 year old to play! The visuals capture the perfect Halloween night atmosphere! The best part of this game has to be the visuals. Think of Halloween for one minute. What do you picture in your mind? That’s exactly what this game looks like. Every house is covered in Halloween decor, brown and gold leaves litter the ground, jack-o’-lanterns flicker all over the neighborhood, and all of the neighbors have come together to host a giant Halloween block party with apple bobbing, pie contests and more! 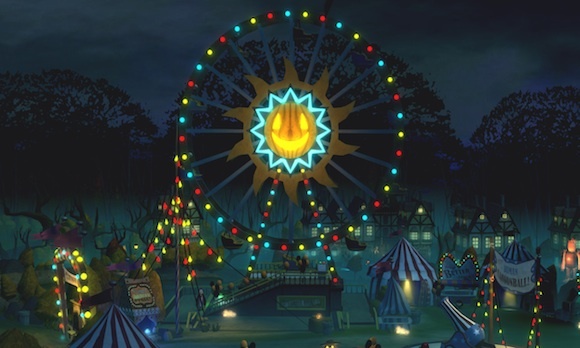 And if that isn’t enough Halloween spirit for you, the second half of the game takes place in a decked out shopping mall, complete with Halloween costume contest, and the final part of the game sends you to an eerie Halloween carnival! Take a trip to a Halloween night carnival! There are also Halloween costumes galore. Each costume has a different power up that will help you in battle against the Grubbins. Best of all, you can change costumes any time you wish, helping you get over obstacles and solve puzzles to progress the game forward. Building costumes, collecting candy and fighting Grubbins are all a lot of fun, especially when playing is such amazing environments! Your kids will fall in love with the perfectly eerie yet cute Halloween visuals, and of course they will be even more excited to go out trick or treating and experience an adventure of their own! I hope yu are as enthralled with this game as I am. It definitely deserves its place as a yearly tradition for the entire family!